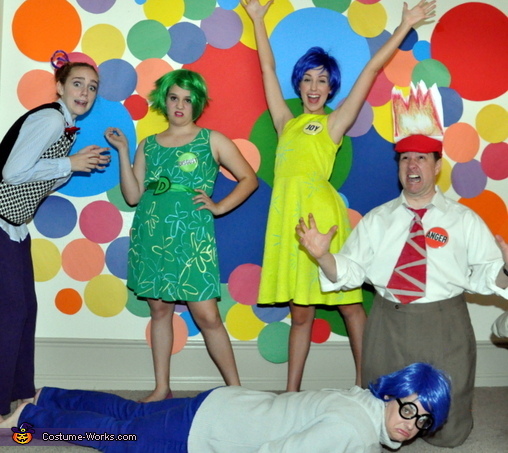 Inside Out Emotional Family! My inspiration came from the Disney Movie Inside Out. I began researching and gathering costume pieces before the movie was even out in June 2015. It quickly became my new obsession and I was happy the movie was just as great as I hoped for! Halloween is my favorite holiday because we get to dress up as a family. I love the gathering process and take it as my personal challenge to do it as inexpensively as possible. It’s really a fun family experience and makes for great scrapbooking later! My creative process involves thrift stores, craft shops and online shopping for those hard to find items. I found most of the clothing pieces at a thrift store or online. We decided against painting our faces because unless it is done really well, it looks wrong. However, with the name buttons and colored accents it is undeniable who each Emotion being portrayed is. I hand painted Joy and Disgust's dresses. I ordered all the wigs online looking for the ones that looked most like our characters. I drew the fire on doubled cardstock for Anger’s red hat and stapled it on. Bing Bong’s costume was the most time intensive. I bought pink pig pajamas from Walmart for $20. The brown derby hat and a pink elephant head I found at Savers Thrift shop and cut them apart and added the ears to the hat and attached the trunk to his purple bow tie I made. The jacket was also thrifted, I shortened it and added big colorful buttons, patches and blue puff paint. Hobby Lobby had extra large orange chenille stems I used to wrap around Bing Bongs’ legs for a striped effect. I cut off the fingers of some gloves I had and TA DA!...the imaginary friend, Bing Bong was born. It all makes me want to cry candies! These are all my girls and one friend joined the fun as Bing Bong. We did a quick spoof of Riley and her imaginary boyfriend with clothes we already had and a handmade sign just because, well,... why not?! The best part is the fun we have posing for pictures. I am grateful I have such willing accomplices who continue to let me play dress up with them.